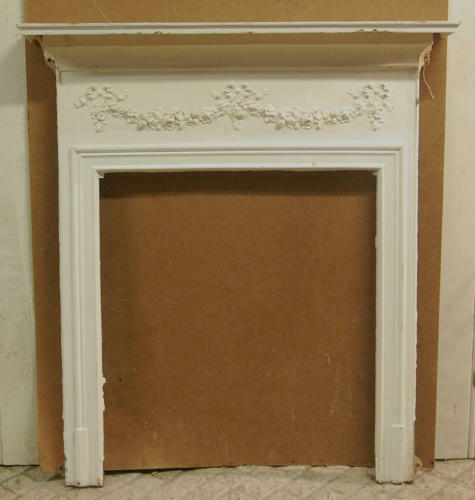 A very pretty Victorian, painted, cast iron fire surround with heavy mantel and pretty design. The fire has a lovely, classic design, typical of the era, with flowers, swags and bows. The fire has a paint finish and has not been stripped. The fire opening has a linear border and fixing lugs at the top and bottom are present and intact. The mantel is of a good proportion, with a stepped border. The fire is well constructed, heavy and solid. The fire is an antique and therefore has some signs of use and wear. There are some scratches, marks, chips and knocks. There are chips and peeling to the paintwork and some staining and wear. The bottom of the left hand leg (when facing the fire) has some paint missing. The back has surface rust as expected. Purchaser can strip and refinish the fire with paint or a blacked and polished finish as desired. A beautiful antique fire thats size would suit both a living room or bedroom. The fire has a great quality and classic design that would suit both a period or modern property. We have two similar, stripped, blacked and polished fires available. Please see our other listings for details.